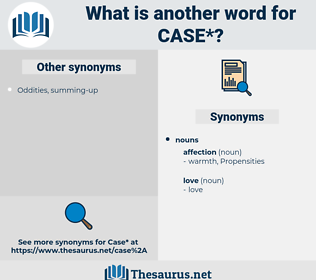 What is another word for case? An event; state or condition; statement; issue at law; inflection of nouns, & c.
allegations, aspects, particulars, Concentrations, requirements, developments, competitors, demands, ACS, Agencies, levels, views, concerns, data, cause, causes, matter, matters, circumstances, issues. supernatants, Incidences, admissions, isolations, calls, regimens, dorks, circumstances. data, cause, matter, respect, argumentation, caselaw, case-file, coincidence, happening, lowercase, thing, dissertation, possibility, rate. Caused, Arose, used, Existed, represented, considered, Created, Dealt, Occurred, applied, included, Came, led, Resulted, Referred, Cited, needed, Listened, Obtained, Was, Were, Accounted, Died, Took, loved, Had, Looked, Meant, thought, found, Did. Arising, dealing, Occurring, supplying, lacking, Deleting, Responding, tracking, qualifying, accounting, engaging, travelling, asking, dying, looking, riding, going, drinking. closed, accomplished, Happened, dismissed, commissioned, Argued, Filed, Dealt, Managed, Exemplified, Carried, adjusted, Occurred, presented, handled, shared, ignored, heard, Referred, needed, Undertaken, said, faced, Confronted, Entailed, Brought. arises, exists, factors, interacts, contracts, reports, indicates, appears, deals, occurs, treats, operates, Comes, belongs, works, depends, proves, entails, fits, goes, Does, concerns, matters. 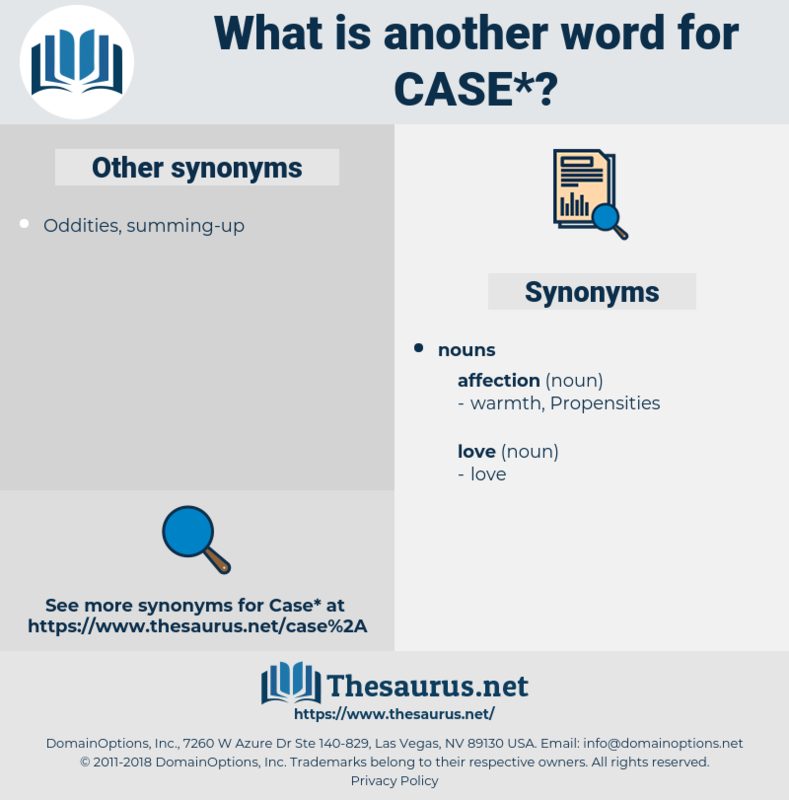 circumstance, eventuality, occasion, casework, course, exception, affair, connection, episode, reasoning. I'm afraid that's your case too. That, that is just my Case! compact, powder compact, shoe, glasses case, watch case, pocketbook, billfold, baggage, dispatch case, quiver, gun case, letter case, locket, sleeve, wallet, pillbox, writing desk, cigarette case, notecase, cardcase, dispatch box, luggage, portfolio, briefcase, kit. bit, humiliation, time, clip, mortification, piece. client, patient, charity case, referral, welfare case. happening, natural event, Occurrent, occurrence. individual, person, soul, mortal, somebody, someone. circumstance, frame of mind, state of mind.